Show off your cool style with the LOVE Moschino® Box Clutch. Rectangle clutch with brand name along the front. Chain link crossbody strap. Top clasp closure. Gold-tone hardware. Lined interior with back-wall slip pocket. 100% man made upper and lining. Imported. This item may ship with an attached security tag. Merchandise returned without the original security tag attached or a damaged tag may not qualify for a refund. Measurements: Bottom Width: 7 in Depth: 1 3⁄4 in Height: 4 3⁄4 in Strap Length: 44 in Strap Drop: 21 in Weight: 1 lb 4.2 oz This product may have a manufacturer's warranty. Please visit the manufacturer's website or contact us at warranty@support.zappos.com for full manufacturer warranty details. 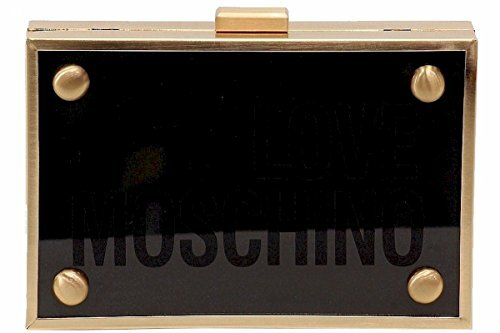 Show off your cool style with the LOVE Moschino® Box Clutch. Rectangle clutch with brand name along the front.